I became a fan of Saffron Craig, an Australian fabric designer, when I found a shop that carried her fabrics here in the States. The color combinations and her whole design aesthetic were wonderful and different. And then I discovered Kate Conklin, a fabulous Australian quilter and designer, and she was using Saffron's fabrics. And then Kate and Saffron combined forces with Saffron's newest line of fabric and offered a kit. What? Saffron's fabric and Kate's quilt designs? I was powerless. It was a must-have. The kit came in the mail yesterday and I can hardly wait to begin making it. And then I will have to find someone who likes pink, brown and pretty little hearts. You know. Maybe someone like this cutie, who seems to like pink and brown. And don't even get me started on Australian quilter extraordinaire, Rita with Red Pepper Quilts. I am systematically reading through her entire archives and all her Flickr photos. She is amazing! 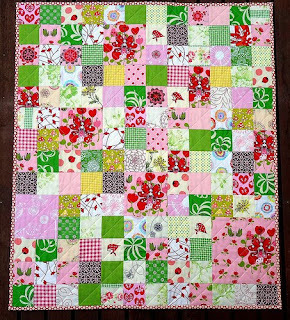 And her latest quilt? Saffron Craig fabrics, of course. So much inspiration from Down Under. 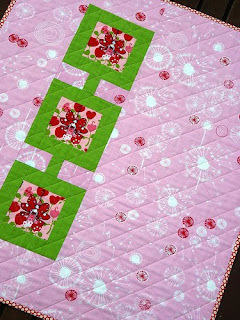 I'm just biding my time till I can get started on another Kate Conklin quilt. I'm thinking, Charm Bracelets :). I'd love to design some quilts with their fabric. Just got to save my pennies. These are really great stuff. I also checked Kate's suggestions and there is really talent down under. It made me want to start a quilt collection.